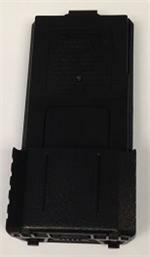 BL-6AAA: Compact 6xAAA Alkaline Battery Case for Baofeng UV-5R, UV-5RHP, UV-5RA, UV-5RB, UV-5RE, TYT F8 radios, and many more. 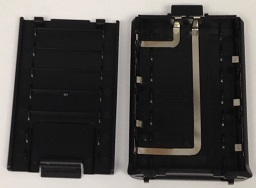 Replaces the BL-5 and BL-5B battery packs. Load with 6 x AAA Dry Cells (Alkalines) for instant high-watt power. Compact size; does not add length to HT. Why choose ours: we custom-prepare these cases so that when you install the batteries, they are stablized and provide sure power; they do NOT slip out of place and lose contact, like th untreated AAA cases. 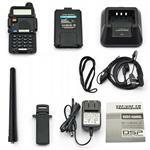 BDC-5: Data Cable & Programming Disc for Baofeng & Pofung UV-5R, UV-5RE, UV-5RS, UV-5RHP, UV-5RA, TYT F8, etc. Enables fast programming of the radio from a PC. 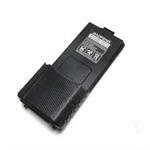 BL-5: 7.4v 1800mAh rechargeable Li-ION battery for BAOFENG & Pofung UV-5R, UV-5RHP, UV-5RA, UV-5RE, UV-5RB, TYT F8, etc. Replaces original part # BL-5. 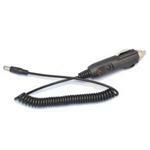 DCUV-5R: Custom DC Power Cable for CH-5 Base Charger for UV-5R. Outputs 10VDC to the CH-5 base charger. 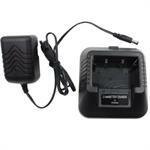 CH-5: Desktop Smart Charger for BAOFENG Pofung HYT TYT BL-5 BL-5L etc. 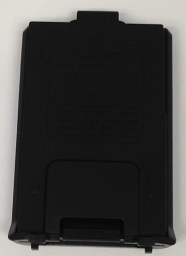 CBE-UV5 : Battery Eliminator for Baofeng Radios (UV-5R), etc. CBE-UV5 : Battery Eliminator for Baofeng UV-5R radios, etc. Clips onto radio; has coiled cord; other end plugs into 12-13.8VDC socket. Provides instant high-watt mobile power ! BL-6AA : 6 x AA Alkaline Battery Case for Baofeng UV-5R, UV-5RB UV-5RE UV-5RE, TYT F8 radios. BL-5L : 7.4 volt 3800mAh rechargeable LONG LIFE Li-ION battery for Baofeng radios, such as UV-5R, etc. UV-5R: 5-Watt Dual Band HT radio & accessories. Includes UV-5R dual-band radio, antenna, lanyard, battery, charger, 12VDC power cord, ear wrap & mic, and belt clip. SUPER VALUE ! UV-5RHP: 7-Watt Dual-Band HT radio with accessories. Includes UV-5RHP dual-band radio, antenna, lanyard, battery, charger, EXTRA 12VDC power cord, ear wrap & mic, and belt clip. Brand new in factory box; SUPER VALUE !